In London vandalism is rife, and anything that can be broken will be broken sooner or later. I was surprised and sad to see graffiti and vandalism in Tokyo appears to be on the increase. I saw a lot of graffiti and the seat of this scooter has been severly slashed for no apparent reason. Perhaps someone was annoyed with the owner for having parked in the wrong place (because the scooter appears to be illegally parked in this picture), but the number cuts suggested to me an act of meaningless destruction. 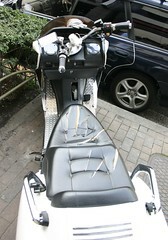 Yohei Morita suggests that the reason why this motorcycle seat was slashed may be related to the fact that the motorcycle is rather flamboyant. This possibility is born out by the experience of my friend whose Shinagawa registered Toyota Supra was scratched, apparently simply because it was flamboyant and out of place among the other cars in the car park in Kyushu. The Japanese maxim "the nail that sticks out gets beaten down," may translate to "the flamboyant vehicle gets vandalised."